There is something very comforting about cobbler. It’s not fancy or elegant. It’s warm, welcoming and homey. And if prepared correctly, it’s very delicious. The cobblers at The Gourmet Cobbler Factory in Pasadena are baked with love from an old Southern family recipe and they are really, really good. I like to buy (and devour) them piping hot out of the oven. 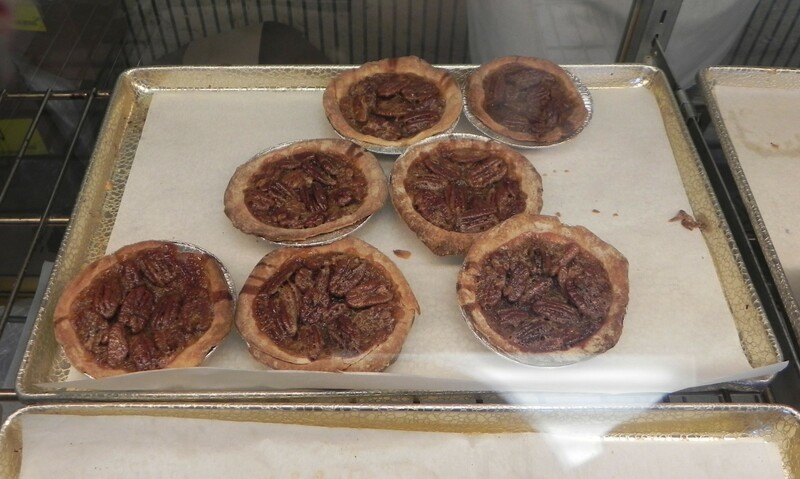 They have the most delicious golden brown crust, which is the perfect thickness and not too sweet. Beneath the crust is a warm, juicy, sweet and tart fruit filling. 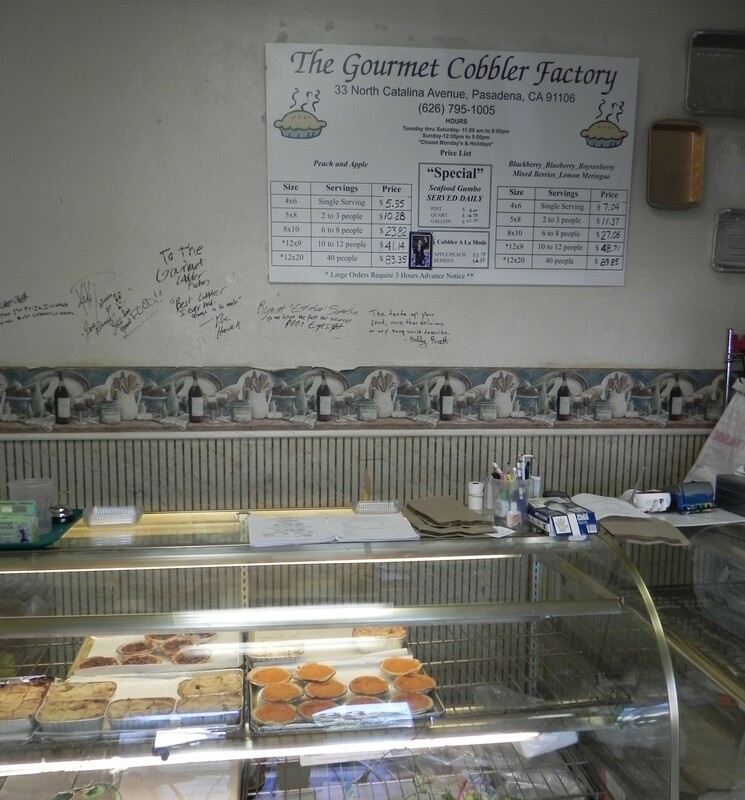 The Gourmet Cobbler Factory is hardly a factory. It’s a very small and unassuming family-run bakery on a small side street off of Colorado (and not the trendy Old Town part of Colorado). They don’t sell lattes. There is nowhere to sit; everything is to go. The place looks slightly run down, but don’t let that fool you. It’s all about the cobbler here plus a few other baked goods including delicious pecan and sweet potato pies. 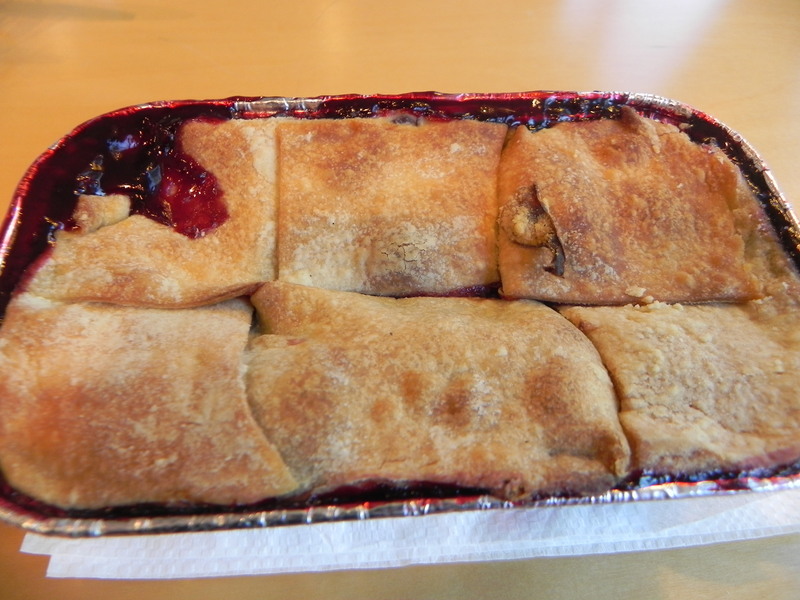 The cobblers come in many flavors, including mixed berries, blackberry, peach, apple, boysenberry and blueberry. My favorite is the mixed berries. 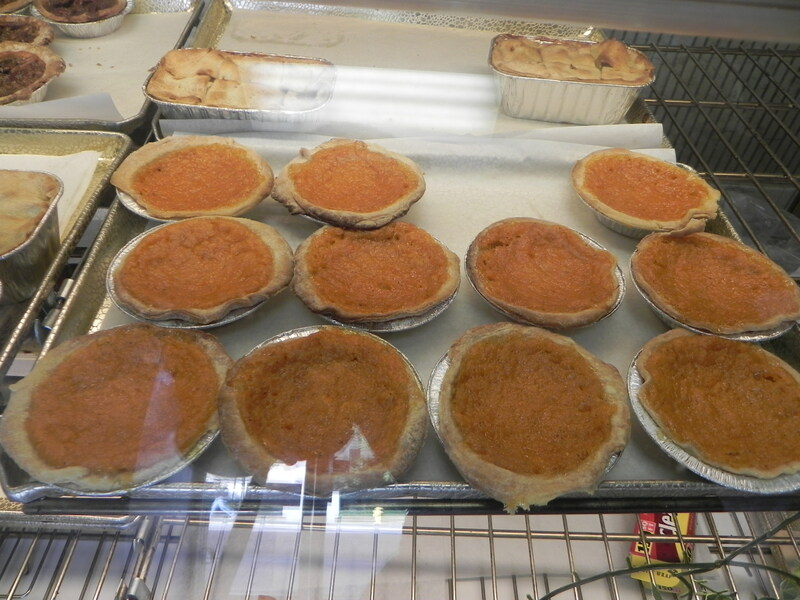 They also serve great seafood gumbo as well as bbq sometimes on the weekends, but I come for the cobbler and pies. It’s a great treat to take a couple cobblers home for dessert and serve them hot with scoops of vanilla bean ice cream. Or, even better, if you’re invited to a dinner party, show up with a couple of these babies and they will no doubt be the hit of the party! 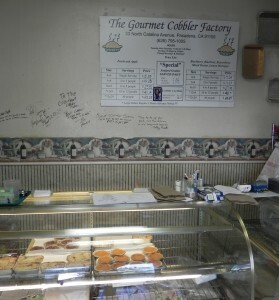 The Gourmet Cobbler Factory is located at 33 N Catalina Ave. in Pasadena. I want this! But good sense won’t allow. how do you stay in such good shape! yikes, yet another opportunity for my angel and my devil to meet! They will have a spirited debate over this one. I’m DROOLING!!!!! If it weren’t 9:15 PM I’d jump in the car and grab some. Thanks for doing this blog – it’s given us some great eating ideas!! i live in Dublin Ireland when i lived i L.A i used to drive to Pasadena to buy the best peach cobbler in the world, as of yet it is not rivaled . wish i had their recipe.